This evening I wanted to have something super quick and easy to make for dinner. I rambled around in the fridge and pulled out a package of chicken cutlets, a bag of "Eat Smart's 7 Superfood Salad Mix" and a bowl of my cranberry sauce. I decided to make us big salads topped with sauteed chicken cutlets that I seasoned with McCormick's Chipotle & Roasted Garlic Seasoning. I love preparing chicken cutlets on weeknights because they take less than 10 minutes to cook. I lightly seasoned them and sauteed for 4 to 5 minutes per side in a bit of olive oil. While they cooked, I piled the salad mix on our plates and whisked together a quick Cranberry Chipotle Vinaigrette (cranberry sauce, apple cider vinegar, avocado oil and the chipotle seasoning) for my salad. 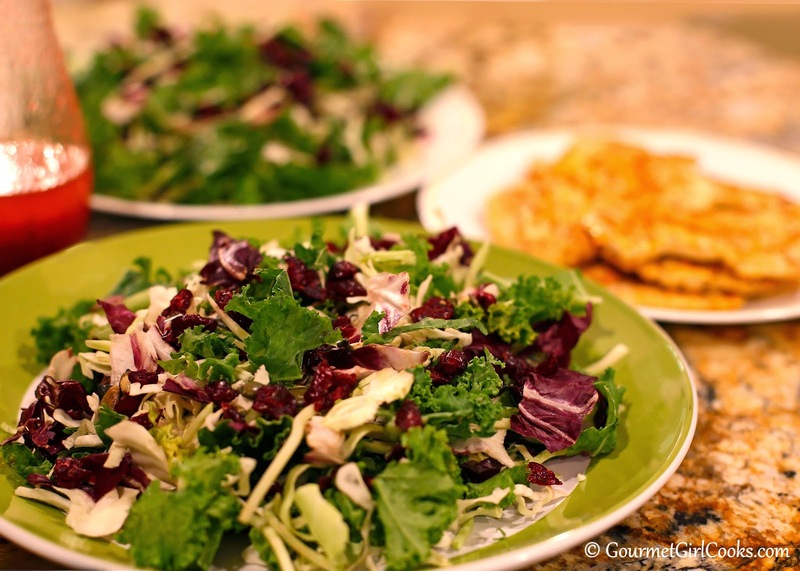 Hubby uses the poppyseed salad dressing that comes with the salad mix. I cut the seasoned chicken up into bite sized pieces and placed it on top of our salads. I have enough left for lunch tomorrow, too, which is always a good thing. In about 15 minutes, we were sitting down to dinner. I snapped a quick photo below for you to see. Enjoy!